Home / Uncategorized / Our Semitic Apparel Holiday Sale! 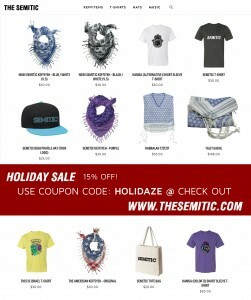 Our Semitic Apparel Holiday Sale! As a big Thank You to all that have continued to support us, we are launching a sale with 15% off everything in the semitic shop! Use coupon code ’HOLIDAZE’ at check out. No one does Semitic swaggier than us!SMF LA Show Announcements!